BCPI supports the effort to modernize offices to use minimal paper and convert all forms of documentation to any digital form. The ideal goal of reducing paper usage creates productivity gains, costs savings, space saving, effeciency in the need to share information, andimportantly, a reduced environmental impact. BCPI can move you from an obsolete or outdated technology into a modern, efficient database. Databasing allows you to find information quickly and with precision, gathering everything you need and avoiding time spent on non-applicable information. BCPI performs database building using Alchemy, MS, SQL, Access or Oracle (among others) with stand-alone capabilities over your local area network. Convert Electronic Document Format information to any format desired: Full Text, HTML, Tiff, Jpeg, GIF, AutoCad, etc. 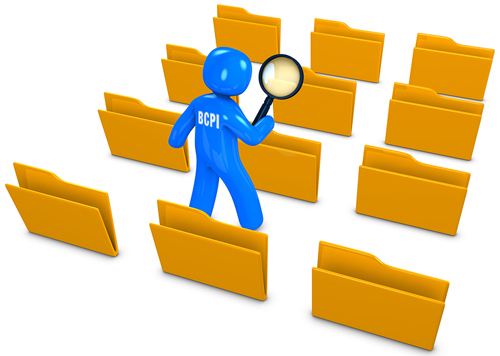 BCPI has converted literally millions of documents to modern database systems for the U. S Government and private businesses. We are experts at solving for data storage and conversion. You do not have to be trapped in an obsolete technology or reliance upon paper storage. To see a list of some of our clients, go here.